Musorgsky's musical tribute to the painter and architect Viktor Hartmann has become his most familiar work, and this recording presents the original piano version of Pictures from an Exhibition. It is an extraordinary work, combining intense demands for virtuoso technique with an inexorable momentum which keeps what is fundamentally an impressionistic work in many movements moving towards its grand climax with the 'Great Gate of Kiev' finale. Prokofiev is one of those composers who would constantly reuse material from one work in another. However, although the Ten Pieces from Romeo and Juliet may seem at first glance to be merely a medley gleaned from the more famous ballet, it should not be forgotten that Prokofiev published the set independently and that it was first performed the year before the finished ballet, perhaps by way of an advertisement for the more challenging (financially, at least) work to follow. Also included here is Prokofiev's Toccata, written in 1912 while he was at the St Petersburg Conservatoire. The work was possibly conceived as a movement of the Second Piano Sonata, but Prokofiev evidently decided the work was worthy of publication in its own right. The Russian painter and architect Viktor Hartmann died suddenly in Moscow during the morning of Wednesday 23 July 1873. One of his close friends—not of long standing, for they had met but a few years before—was the composer Modest Musorgsky. In 1856, at the age of seventeen, Musorgsky, scion of a wealthy family, had joined the famous Imperial Preobrazhensky Guards as an officer cadet. Soon after joining the army, Musorgsky was to meet the twenty-three-year-old military doctor Alexander Borodin, who was attached to the same barracks, and their mutual interest in music developed into a close friendship. Borodin later described his younger colleague as ‘a dapper, aristocratic little cadet officer, rather affected and foppish, who would sit at the piano and play excerpts from Verdi’s operas’. In those days, the life of a Guards officer in the Russian army was largely given over, socially at least, to drinking, gambling and almost all other forms of licentiousness. The seeds of the chronic alcoholism which claimed Musorgsky’s life at the age of forty-two in 1881 were sown at this time. Borodin also described Musorgsky as a somewhat weak character, an impression certainly not imparted by Musorgsky’s music. The death of Viktor Hartmann affected Musorgsky deeply and, within two years of the loss of his friend, Musorgsky was to pay Hartmann two memorial tributes in music. The first was inspired by a large posthumous exhibition of the painter and architect’s work, comprising about four hundred watercolours, drawings, sketches (some of which belonged to Musorgsky himself), architectural drawings and impressions of projected buildings and monuments, together with theatrical and costume designs. This major exhibition was held in St Petersburg a year after the death of Hartmann. The initial musical tribute by Musorgsky took the form of a suite for solo piano, affectionately and appropriately titled Pictures at an Exhibition. Each movement takes its inspiration, and title, from one of the exhibits, and occasionally the movements are linked by what Musorgsky termed a Promenade, which may possibly be a self-portrait (albeit not an extensive one) of the composer, strolling through the gallery and looking at each picture in turn. If this is indeed a self-portrait, the composer honestly portrayed himself as being hardly sylph-like, thoughtfully wandering around the exhibition in measured pace. The Promenade theme itself, marked ‘nel modo russico, senza allegrezza, ma poco sostenuto’ has the aspect of Russian liturgical chant and is in irregular metre. Hartmann’s death was to inspire, indirectly, another work from Musorgsky, begun at about the same time as Pictures at an Exhibition, but completed in 1877. This is the song-cycle Songs and Dances of Death—interestingly, the song-cycle quotes directly from Pictures. It is sometimes claimed that, although great pianists are often successful in projecting Pictures at an Exhibition, the work in its original version is not too well conceived for the piano. If this is so, and such a view is often put forward as a justification for the many orchestral (and other) versions which have been made by later composers, the fact that the work demands both a virtuoso technique and deep musical intelligence for its fullest realization is an indication of the quality of the music itself. Musorgsky’s Pictures at an Exhibition is, on this basis alone, clearly a work of significant importance, stature and originality—the last both in its structure and in its handling of the instrument. It remains the case that many of the effects deployed by Musorgsky that may appear to be what is termed ‘unpianistic’ on paper turn out to be tremendously effective in performance. Pianists who possess a transcendental technique will have but little difficulty in negotiating those passages which do not lie comfortably under the fingers. If Musorgsky’s piano writing does not attempt the conventional Romantic techniques of, say, Liszt or Chopin, it is surely the case that the effects are all well imagined and heard by the composer. They are nowhere inappropriate to the piano and will be fully vindicated if the pianist knows precisely what Musorgsky intended. One of the more obvious (but little appreciated) aspects of the underlying unity of this essentially impressionistic work is that, despite being in many movements, Pictures at an Exhibition has a strong sense of momentum that imparts a compelling additional continuity to the composition. This reaches its natural (and musical) climax as the music inexorably moves towards the magnificence of the final Great Gate of Kiev—which seems fit to burst the confines of the keyboard. A further little-appreciated feature of the score is that almost all of the material of Pictures at an Exhibition derives from the opening Promenade. In addition, the ten ‘pictures’ in the work are taken from several ‘types’—namely, the fantastic, the romantic, the humorous, genre pieces and the epic. These are not only contrasted within the overall grouping, but also linked by the five appearances of the Promenade and the thematic unity deriving therefrom. In the romantic Catacombae, and the concluding epic Great Gate of Kiev (a monument planned by Hartmann which was never erected), Musorgsky further unified the composition by incorporating the Promenade within the textures of those movements. Like all great Russian composers, including Musorgsky of course, Serge Prokofiev was attracted to, and wrote for, the stage; yet—equally like all great Russian composers—we hear rather less of Prokofiev’s operas and ballets in the theatre today than in the concert hall or elsewhere. In Prokofiev’s case we have the composer himself to thank for making his theatre music more accessible, for he was—of all great twentieth-century composers—perhaps the most thrifty in terms of refashioning his material to various ends. In this regard, of course, he was merely following long-established custom, but Prokofiev continued this practice to a greater degree than almost any other composer. Such a recreative approach to composition does not apply to all composers, nor to all theatre music. Prokofiev’s success in this field stems, at heart, from his own creative methods. His manner of working, established early in his career, hardly varied. He would carry with him a large notebook into which he would jot all his ideas, and when he had accumulated enough material he would begin the score. Before arriving at that stage, however, the material had already gone through several refining processes. The first was that of his creative imagination—for hardly a moment elapsed when Prokofiev was not thinking about the music in question. Secondly, Prokofiev was an exceptionally gifted pianist who, even after he gave up public appearances, played the instrument daily, when he would refashion or try at the keyboard ideas about which he had been thinking, extemporizing at will. The keyboard, therefore, became a powerful tool in Prokofiev’s creative process. And when it came to the scores themselves, his orchestral ones in particular, they had much of the appearance of piano reductions—often extended by the addition of extra staves when necessary. More often than not, Prokofiev’s music would be first committed to paper in a way which would enable a piano reduction to be made virtually at sight, with very little ‘arranging’ having to be done. In addition, Prokofiev’s music was essentially additive—first one idea, then another, his skill best shown in his ability in joining these elements, in fusing them coherently. In this regard, Prokofiev was a great master. Such an approach is perfect for theatre music, especially the ‘classical’ ballet. Around the early part of 1934, Prokofiev was edging towards making the decision which became irrevocable for him—a permanent return to Russia after his post-Revolutionary years in the West. His previous ballets—four in total—had each received their premieres in Paris, but the Kirov Theatre in Leningrad was anxious to tempt Prokofiev with the offer of a new, large-scale work. However, the negotiations were inconclusive, and the contract for Prokofiev’s fifth ballet, Romeo and Juliet, was signed with the rival Bolshoi Theatre in Moscow. The music was written, at Prokofiev’s usual speed, in the summer of 1935, and the ballet was ready to go into rehearsal at the turn of the year. But an artistic bombshell was about to explode. In January 1936, Dmitri Shostakovich’s successful opera Lady Macbeth of Mtsensk and his new ballet The Limpid Stream were fiercely denounced in two Pravda editorials, throwing the musical world into turmoil. All new productions were put in jeopardy; the Bolshoi then declared that Prokofiev’s Romeo and Juliet could not be danced to, and the proposed production was cancelled. Prokofiev was disheartened, but not devastated; if he did not realize the seriousness of the official threat to art, in any event he had, quite by chance, luckily ensured his acceptance as a genuine Soviet artist by the phenomenal success of Peter and the Wolf and the suite from the film of Lieutenant Kijé. In spite of the failure to get an early production of Romeo and Juliet in Russia, Prokofiev did all he could to rescue his score—which he must have known was excellent—from oblivion. He made two orchestral suites for concert use, and a set of ten pieces for solo piano, which he published as his Opus 75. 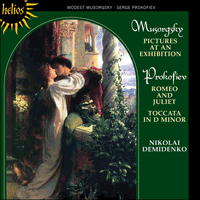 Prokofiev himself first performed the Ten Pieces from Romeo and Juliet publicly in Moscow in 1937, and this suite marked the first appearance of the Romeo and Juliet music in any form in print. The items of the piano suite were, as we noted earlier, close to the ‘original’ version of the ballet music; the publication of Prokofiev’s Opus 75 proved useful as a means of promoting the ballet itself, and it was in December 1938 that Romeo and Juliet was first staged, not in the USSR but in Brno, Czechoslovakia. The Russian premiere was given, curiously, not by the Bolshoi Company that had commissioned it, but by the Kirov Company, in Leningrad, in January 1940. However, it cannot be emphasized too strongly that Prokofiev’s Opus 75 has to be considered as a separate independent piano work, not as a ‘second hand’ score. In the piano suite, the ballet order is changed considerably, for musical reasons—we should not expect a depiction of the stage events in sequence—and the piano version differs in some material respects from the orchestral scores (the ballet score and the concert suites). Prokofiev’s use of a separate opus number and his own public performance of the work in recital clearly show the importance he himself placed upon the keyboard version. But no matter in what form we hear this music, it could be by no other composer. Prokofiev’s distinctive, admirable and unforgettable genius is apparent in almost all of his first seventeen published compositions, that is to say those written during the latter half of his time as a student at the St Petersburg Conservatoire—which he attended for ten years from 1904. These include his brilliant Toccata in D minor, written in 1912 and published the following year. There is some internal evidence to suggest that the composer originally intended the Toccata to form part of his Second Piano Sonata, Op 14, composed at the same time and sharing the same tonality, but withdrew it and issued it as a separate concert piece. It appears that the first public performance of this work did not take place until 10 December 1916, given by the composer himself, in a recital that included the first performance also of his Sarcasms, five piano pieces, Op 17. Le mercredi 23 juillet 1873, au matin, disparut subitement à Moscou Viktor Hartmann, peintre et architecte russe qui comptait parmi ses amis intimes le compositeur Modeste Moussorgski, rencontré juste quelques années auparavant. Ce dernier, issu d’une riche famille, était entré comme cadet chez les célèbres gardes impériaux de Preobrajenski en 1856, à dix-sept ans. Il devait, peu après, faire la connaissance du médecin militaire Alexandre Borodine (alors âgé de vingt-trois ans), attaché à la même caserne; leur goût commun pour la musique se mua en une étroite amitié. Par la suite, Borodine décrivit son jeune collègue comme «un petit cadet soigné, aristocratique, plutôt affecté et dandy, qui s’asseyait au piano et jouait des extraits d’opéras de Verdi». À cette époque, la vie sociale d’un officier des gardes impériaux de l’armée russe était largement consacrée à la boisson, aux jeux et à presque toutes les autres formes de licence. Ainsi furent semées les graines de l’alcoolisme chronique qui devait emporter Moussorgski en 1881, à quarante-deux ans. Borodine décrivit également Moussorgski comme un personnage quelque peu faible, une impression qui ne transparaît certainement pas dans ses œuvres. Profondément affecté par la perte de son ami Viktor Hartmann, Moussorgski lui rendit deux hommages musicaux dans les deux années qui suivirent sa disparition. Le premier fut inspiré par une grande exposition posthume consacrée à l’œuvre du peintre et architecte, avec quelque quatre cents aquarelles, dessins, esquisses (dont certaines appartenant à Moussorgski lui-même), dessins architecturaux et tirages de bâtiments et de monuments en projet, de même que des études pour le théâtre et des ébauches de costumes. Cette grande exposition se déroula à Saint-Pétersbourg, un an après la mort de Hartmann. Le premier hommage musical de Moussorgski revêtit la forme d’une suite pour piano solo, intitulée avec affection, et à-propos, Tableaux d’une exposition. Les mouvements, qui doivent tous leur inspiration et leur titre à l’une des pièces exposées, sont parfois reliés par ce que Moussorgski appela une Promenade, autoportrait possible (mais bref) du compositeur déambulant à travers la galerie et regardant les tableaux un à un. S’il s’agit effectivement d’un autoportrait, Moussorgski s’est honnêtement dépeint sous les traits d’un personnage guère gracile, parcourant pensivement l’exposition d’un pas mesuré. Le thème de la Promenade, marqué «nel modo russico, senza allegrezza, ma poco sostenuto», présente l’aspect du chant liturgique russe et est sis dans une mesure irrégulière. La mort de Hartmann fut aussi l’inspiratrice indirecte d’une autre œuvre de Moussorgski, entreprise grosso modo en même temps que Tableaux d’une exposition, mais achevée en 1877: le cycle de mélodies Chants et danses de la mort qui, fait intéressant, reprend directement Tableaux. D’aucuns prétendent parfois que, bien que les grands pianistes parviennent souvent à rendre l’œuvre, Tableaux d’une exposition n’est pas, dans sa version originale, très bien conçue pour le piano. S’il en est ainsi—et pareille opinion est souvent avancée pour justifier les nombreuses versions orchestrales (et autres) de compositeurs ultérieurs—, la technique virtuose et la profonde intelligence musicale nécessaires à l’entière réalisation de cette pièce sont le signe de la qualité intrinsèque de la musique. Sur cette seule base, Tableaux d’une exposition est, de toute évidence, une œuvre d’une importance, d’une stature et d’une originalité (dans sa structure comme dans son traitement de l’instrument) majeures. Reste que nombre des effets déployés par Moussorgski, qui peuvent sembler «non pianistiques» sur le papier, se révèlent terriblement efficaces à l’interprétation. Les pianistes doués d’une technique transcendantale n’auront guère de peine à négocier ces passages malaisés. Si l’écriture pianistique de Moussorgski n’essaie pas les techniques romantiques conventionnelles d’un Liszt ou d’un Chopin, chaque effet est assurément bien imaginé et entendu par le compositeur. Aucun n’est inadapté au piano et tous seront pleinement défendus si le pianiste connait précisément les intentions de Moussorgski. L’un des aspects les plus manifestes (mais peu pris en compte) de l’unité sous-jacente de cette œuvre fondamentalement impressionniste est que ses nombreux mouvements n’excluent pas un fort sentiment d’élan, source d’un irrésistible supplément de continuité. L’ensemble atteint son apogée naturel (et musical) à mesure que la musique se meut inexorablement vers la magnificence de la Grande porte de Kiev finale—qui semble prête à faire éclater les limites du clavier. Autre trait mésestimé de la partition: la quasi-totalité de son matériau provient de la Promenade initiale. De plus, les dix «tableaux» de l’œuvre empruntent à différents «genres», à savoir les genres fantastique, romantique et humoristique, les pièces de caractère et le genre épique. Bien que mis en contraste à l’intérieur du regroupement global, ils sont liés par les cinq apparitions de la Promenade et par l’unité thématique qui en dérive. Ainsi, Moussorgski unifia davantage la composition en incorporant la Promenade aux textures du romantique Catacombes et de l’épique Grande porte de Kiev (un monument conçu par Hartmann, mais qui ne vit jamais le jour) conclusive. À l’instar de tous les grands compositeurs russes (Moussorgski y compris, bien sûr), Serge Prokofiev fut attiré par la scène, pour laquelle il écrivit d’ailleurs; cependant, ses opéras et ses ballets—comme ceux de tous les grands compositeurs russes—demeurent plutôt moins entendus au théâtre que dans les salles de concert, ou autre part. Nous devons remercier Prokofiev d’avoir rendu sa musique de théâtre plus accessible, lui qui fut peut-être le plus florissant de tous les grands compositeurs du XXe siècle en termes de refonte de son matériau à diverses fins. Certes, il ne fit que suivre une tradition établie depuis longtemps, mais il le fit bien davantage que presque tous les autres compositeurs. Une telle approche de recréation compositionnelle ne s’applique ni à tous les compositeurs, ni à toutes les musiques de théâtre. Le succès de Prokofiev en la matière résulte, au fond, de ses propres méthodes de création. Établie tôt dans sa carrière, sa manière de travailler varia peu: il portait sur lui un grand carnet dans lequel il notait toutes ses idées, commençant la partition dès qu’il avait accumulé assez de matériau. Mais, avant d’arriver à cette étape, le matériau avait déjà subi plusieurs épurements. Le premier était celui de l’imagination créatrice du compositeur, qui ne restait guère un instant sans penser à la musique en question. Prokofiev était, de surcroît, un pianiste exceptionnellement doué, qui continua à jouer du piano tous les jours—même après avoir renoncé à toute apparition publique—pour reforger ou essayer les idées pianistiques auxquelles il avait pensé, improvisant à volonté. Le clavier devint ainsi un outil puissant dans son processus créateur, et ses partitions, surtout ses partitions orchestrales, ressemblèrent beaucoup à des réductions pour piano—souvent prolongées, lorsque nécessaire, par l’adjonction de portées supplémentaires. Prokofiev commençait généralement par coucher sa musique sur le papier, de manière à pouvoir exécuter une réduction pour piano presque à vue, avec très peu d’«arrangements». De plus, sa musique fonctionnait essentiellement par ajout—d’abord une idée, puis une autre, la maîtrise du compositeur ressortant le mieux dans sa capacité à joindre ces éléments en les fusionnant avec cohérence. Prokofiev fut, à cet égard, un grand maître. Une telle approche est parfaite pour la musique de théâtre, en particulier pour le ballet «classique». Au début de 1934, Prokofiev s’achemina vers une décision irrévocable: son retour permanent en Russie, après ses années postrévolutionnaires passées en Occident. Les premières de ses quatre précédents ballets avaient toutes été données à Paris, mais le Kirov de Leningrad s’empressa d’attirer Prokofiev avec une proposition d’œuvre nouvelle, à grande échelle. Mais les négociations n’aboutirent pas et Prokofiev signa le contrat pour son cinquième ballet, Roméo et Juliette, avec le Bolchoï de Moscou, rival. Il écrivit la musique à sa vitesse habituelle, durant l’été 1935, et le ballet fut prêt à être répété au tournant de l’année. Mais une bombe artistique était sur le point d’exploser: en janvier 1936, l’opéra à succès de Dimitri Chostakovitch, Lady Macbeth de Mzensk et son nouveau ballet Le Ruisseau clair furent férocement condamnés dans deux éditoriaux de la Pravda, mettant le monde musical en émoi et toutes les nouvelles productions en péril; de fait, le Bolchoï déclara que le Roméo et Juliette de Prokofiev ne pourrait être dansé et annula le projet. Prokofiev fut découragé, mais non anéanti; s’il ne réalisa jamais la gravité de la menace officielle sur l’art, il s’était assuré, absolument par hasard, sa reconnaissance en tant qu’artiste soviétique authentique grâce au succès phénoménal de Pierre et le loup et de la suite extraite du film Lieutenant Kijé. Ne parvenant pas à obtenir une première production de Roméo et Juliette en Russie, il fit tout ce qui était en son pouvoir pour sauver sa partition—qu’il devait savoir excellente—de l’oubli. Il réalisa ainsi, outre deux suites orchestrales de concert, un corpus de dix pièces pour piano solo, publié sous le numéro d’opus 75. Il donna lui-même la première exécution publique des Dix Pièces de Roméo et Juliette à Moscou, en 1937, et cette suite marqua la première apparition de la musique de Roméo et Juliette sous forme imprimée. Les pièces de la suite pour piano furent, comme nous l’avons déjà noté, proches de la version «originale» de la musique de ballet; la publication de l’op. 75 de Prokofiev se révéla un utile moyen de promotion du ballet lui-même et Roméo et Juliette fut monté pour la première fois en décembre 1938, non en U.R.S.S. mais en Tchécoslovaquie, à Brno. Curieusement, la première russe fut donnée non par le Bolchoï, commanditaire de l’œuvre, mais par le Kirov de Léningrad, en janvier 1940. Cependant, l’on n’insistera jamais assez sur le fait que l’op. 75 de Prokofiev doit être considéré comme une œuvre pour piano indépendante et distincte, et non comme une partition de «seconde main». La suite pour piano change considérablement l’ordre du ballet pour des raisons musicales—nous ne devons pas nous attendre à une peinture des événements scéniques dans l’ordre—et la version pour piano diffère, à certains égards matériels, des partitions orchestrales (la partition de ballet et les suites de concert). L’usage d’un numéro d’opus distinct, ajouté au fait que Prokofiev interpréta la Suite en récital, montre clairement l’importance que le compositeur accordait à la version pour clavier. Mais peu importe la forme sous laquelle nous entendons cette musique, elle ne saurait être d’un autre compositeur. Le génie particulier, admirable et inoubliable de Prokofiev est manifeste dans presque toutes ses dix-sept premières compositions publiées, à savoir celles écrites dans la seconde moitié de ses études au Conservatoire de Saint-Pétersbourg—dont il suivit les cours pendant dix ans à partir de 1904. Ces pièces comprennent sa brillante Toccata en ré mineur, composée en 1912 et publiée en 1913. Quelques éléments internes suggèrent que Prokofiev la conçut initialement comme une partie de sa Seconde sonate pour piano, op. 14, composée à la même époque, dans la même tonalité; mais il se ravisa et la publia comme une pièce de concert indépendante. Le compositeur interpréta lui-même la première publique de cette œuvre, qui ne se déroula pas avant le 10 décembre 1916, lors d’un récital incluant aussi la première de ses Sarcasmes, cinq pièces pour piano, op. 17. Der Russische Maler und Architekt Viktor Hartmann verstarb völlig unerwartet in Moskau am Morgen des 23. Juli 1873. Einer seiner engsten Freunde war der Komponist Modest Mussorgsky—allerdings noch nicht lange, da sie sich erst wenige Jahre zuvor kennenlernten. Im Jahre 1856 ging Mussorgsky, Sohn einer wohlhabenden Familie, im Alter von siebzehn Jahren als Offizierskadett zur berühmten Imperialen Preobrajensky Garde. Kurz nachdem Mussorgsky zur Armee ging, machte er Bekanntschaft mit dem dreiundzwanzigjährigen Militärarzt Alexander Borodin, der in der selben Kaserne tätig war. Durch ihr gemeinsames Interesse an der Musik entwickelte sich eine enge Freundschaft. Zu einem späteren Zeitpunkt beschrieb Borodin seinen jüngeren Kollegen als einen „gepflegten, aristokratischen kleinen Offiziersanwärter, ziemlich affektiert und geckenhaft, der am Klavier saß und Stücke aus Verdis Opern spielte“. Damals war das gesellschaftliche Leben von Gardeoffizieren der russischen Armee gekennzeichnet vom Trinken, Glücksspiel und allen möglichen anderen Formen der Unmoral. Der chronische Alkoholismus, an dem Mussorgsky 1881 im Alter von 42 Jahren starb, hatte seinen Ursprung wohl zu jener Zeit. Borodin beschrieb Mussorgsky auch als eine etwas schwache Person, ein Eindruck der gewiß nicht von Mussorgskys Musik herrührte. Der Tod Viktor Hartmanns traf Mussorgsky schwer—in den beiden Jahren nach dem Verlust seines Freundes ehrte er ihn mit zwei musikalischen Hommagen. Das erste Werk wurde durch eine posthume Ausstellung über das Schaffen dieses Malers und Architekten angeregt. Dort waren rund vierhundert Aquarelle, Zeichnungen, Skizzen (einige davon waren in Mussorgskys Besitz), architektonische Zeichnungen und Impressionen geplanter Bauwerke und Monumente, sowie Theater- und Kostümentwürfe zu sehen. Diese große Ausstellung fand ein Jahr nach dem Tode Hartmanns in Sankt Petersburg statt. Mussorgskys erste musikalische Hommage nahm die Form einer Suite für Soloklavier an und erhielt den liebevollen und passenden Titel Bilder einer Ausstellung. Jeder einzelne Satz bezieht seine Inspiration und seinen Titel aus einem der Exponate, und zeitweise sind die Sätze durch etwas verbunden, was Mussorgsky als Promenade bezeichnete und möglicherweise eine Selbstdarstellung des Komponisten verkörpert (wenn auch keine ausführliche), der durch die Galerien schlendert und nach und nach die Bilder betrachtet. Wenn es sich dabei in der Tat um eine Selbstdarstellung handeln sollte, so porträtierte sich Mussorgsky ganz ehrlich als jemanden, der sich kaum wie eine Sylphe, sondern nachdenklich und in angemessenem Tempo durch die Ausstellung treiben läßt. Das Thema der Promenade selbst ist als „nel modo russico, senza allegrezza, ma poco sostenuto“ gekennzeichnet, hat die Erscheinung eines russischen Liturgiegesangs und verfügt über ein unregelmäßiges Metrum. Der Tod Hartmanns regte indirekt noch ein weiteres Werk Mussorgskys an, das er in etwa zur selben Zeit wie Bilder einer Ausstellung begann, aber erst 1877 fertigstellte. Dabei handelt es sich um den Liederzyklus Lieder und Tänze des Todes—interessanterweise bezieht sich der Liederzyklus direkt auf die Bilder einer Ausstellung. Wenn auch große Pianisten die Bilder einer Ausstellung oft mit Erfolg vortragen, so hört man doch gelegentlich die Meinung, daß das Werk in seiner ursprünglichen Fassung eigentlich nicht für das Klavier bestimmt war. Falls dies so sein sollte—diese Ansicht wird oft als Rechtfertigung für viele Orchester- und sonstige Versionen späterer Komponisten verwendet—so ist die Tatsache, daß dieses Werk zur vollständigen Realisierung sowohl nach einer virtuosen Technik als auch nach einer tiefen musikalischen Intelligenz verlangt, ein Merkmal für die Qualität der Musik. Mussorgskys Bilder einer Ausstellung ist alleine auf dieser Grundlage ganz unbestritten ein Werk von enormer Bedeutung, Format und Originalität—sowohl im Aufbau als auch im Umgang mit den Instrumenten. Viele der von Mussorgsky eingesetzten Effekte, die auf dem Papier vielleicht als „unpianistisch“ erscheinen mögen, erweisen sich bei der Aufführung als äußerst wirkungsvoll. Pianisten mit transzendentaler Technik werden bei der Meisterung dieser Passagen mit ihrem unbequemen Fingerspiel nur wenig Mühe haben. Wenn auch Mussorgsky bei seinen Klavierkompositionen nicht den Versuch unternimmt, die herkömmlichen Techniken der Romantik eines, sagen wir mal, Liszt oder Chopin nachzuahmen, so ist es ganz sicher der Fall, daß der Komponist jegliche Effekte genau vor Augen hatte und hörte. An keiner Stelle sind sie für das Klavier unangebracht; erst durch einen Pianisten, der genau versteht, was Mussorgsky beabsichtigte, werden sie völlig gerechtfertigt. Ein viel augenfälliger (wenn auch kaum gewürdigter) Aspekt der grundlegenden Einheit dieses dem Wesen nach impressionistischen Werkes ist das starke Gefühl der Dynamik über das Bilder einer Ausstellung verfügt, welches der Komposition, trotz der Vielzahl der Sätze, eine zusätzliche, zwingende Kontinuität verleiht. Ihren natürlichen (und musikalischen) Höhepunkt erreicht die Komposition, indem sich die Musik unaufhaltsam auf den glanzvollen Abschluß mit dem Großen Tor von Kiew hinzubewegt—welcher im Stande zu sein scheint, die Einschränkungen der Tastatur zu durchbrechen. Ein weiteres, ebenso wenig geschätztes Merkmal der Partitur ist die Tatsache, daß nahezu das gesamte Material der Bilder einer Ausstellung ihren Ursprung in der Promenade zu Beginn hat. Zudem verkörpern die zehn „Bilder“ dieses Werkes verschiedene „Typen“—nämlich das Phantastische, das Romantische, das Humorvolle, Genrestücke sowie das Epos. Diese bilden nicht nur in der Gesamtzusammenstellung untereinander einen Kontrast, sondern sind des weiteren durch das fünffache Auftauchen der Promenade und der daraus resultierenden thematischen Einheit miteinander verbunden. Mit den romantischen Katakomben und dem abschließenden Epos Großes Tor von Kiew (einem von Hartmann geplanten, aber nie errichteten Bauwerk) gibt Mussorgsky der Komposition durch die Miteinbeziehung der Promenade in das Gefüge jener Sätze etwas zusätzlich Einendes. Serge Prokofjew hatte, wie alle bedeutenden russischen Komponisten (darunter selbstverständlich auch Mussorgsky), eine Vorliebe für die Bühne, für die er auch schrieb, und dennoch hören wir heute Prokofjews Opern und Ballette nicht gerade häufig im Theater, sondern vielmehr in Konzerthallen und anderenorts—ähnlich ergeht es auch allen anderen großen russischen Komponisten. Im Falle Prokofjews sind wir dem Komponisten zu Dank verpflichtet dafür, daß er seine Theatermusik etwas zugänglicher gestaltete, denn bei ihm handelte es sich wohl—unter allen bedeutenden Komponisten des zwanzigsten Jahrhunderts—um den sparsamsten hinsichtlich endloser Umgestaltungen seiner Kompositionen zu ständig neuen Versionen. Diesbezüglich folgte Prokofjew freilich bloß einem längst gefestigten Brauch, jedoch in einem weitaus höherem Maße als quasi jeder andere Komponist. Eine so entspannte Vorgehensweise beim Komponieren findet man nicht bei allen Komponisten—ebensowenig bei allen Theatermusiken. Prokofjews Erfolg auf diesem Gebiet rührt, ganz im Inneren, von seiner eigenen Kreativität her. Von seiner schon früh im Leben gefestigten Arbeitsweise wich er kaum ab. Er hatte stets einen großen Notizblock bei sich, in dem er seine Ideen festhielt, und sobald er genügend Material zusammengetragen hatte, begann er mit der Partitur. Bevor dieses Material allerdings auf die Bühne gelangte, war es bereits etlichen Nachbesserungen unterzogen worden. Zunächst einmal war da seine kreative Phantasie—denn kaum ein Augenblick verstrich, in dem Prokofjew nicht mit den Gedanken bei der entsprechenden Musik war. Und zweitens handelte es sich bei Prokofjew um einen außerordentlich begnadeten Pianisten, der selbst nachdem er nicht mehr öffentlich auftrat, noch täglich Klavier spielte und dabei stets die Stücke auf der Tastatur umgestaltete, neue Ideen ausprobierte und nach Belieben improvisierte. Die Tastatur wurde daher für Prokofjew zu einem ausdrucksvollen Mittel in seiner kreativen Entwicklung. Und die Partituren selbst, insbesondere jene für Orchester, erinnerten oft an verkürzte Fassungen für Klavier—die, falls nötig, oft noch durch das Hinzufügen zusätzlicher Notensysteme ausgedehnt wurden. In vielen Fällen wurde Prokofjews Musik zunächst in einer Form zu Papier gebracht, in der verkürzte Fassungen für Klavier quasi aus dem Stegreif gemacht werden konnten, ohne dabei viel „arrangieren“ zu müssen. Hinzu kommt, daß Prokofjews Musik im wesentlichen aufeinander aufbaute—zunächst eine Idee, dann eine weitere; sein Können zeigte sich vor allem in seiner Fähigkeit, verschiedene Elemente miteinander zu verbinden, sie zusammenhängend verschmelzen zu lassen. Darin war Prokofjew wahrlich ein Meister. Diese Technik ist wie geschaffen für Theatermusik, insbesondere für das „klassische“ Ballett. Anfang 1934 traf Prokofjew eine etwas zögerliche Entscheidung, die sich für ihn als unumkehrbar herausstellen sollte—und zwar, daß er nach seinen postrevolutionären Jahren im Westen für immer nach Rußland zurückkehren werde. Seine bisherigen Ballette—vier an der Zahl—wurden alle in Paris uraufgeführt, doch nun war das Kirov-Theater in Leningrad darum bemüht, Prokofjew für ein großes, neues Werk zu engagieren. Die Verhandlungen verliefen allerdings ergebnislos, so daß der Auftrag für Prokofjews fünftes Ballett Romeo und Julia mit dem rivalisierenden Bolschoi-Theater in Moskau unterzeichnet wurde. Prokofjew schrieb die Musik dazu im Sommer 1935 im für ihn üblichen Tempo, und schon zur darauffolgenden Jahreswende begann man mit den Proben fürs Ballett. Doch bald schon sollte in künstlerischer Hinsicht eine Bombe einschlagen. Im Januar 1936 wurden Dmitri Schostakowitschs erfolgreiche Oper Lady Macbeth von Mzensk sowie sein neues Ballett Der klare Bach in zwei Leitartikeln der Prawda aufs heftigste gebrandmarkt, was die Musikwelt in helle Aufruhr versetzte. Alle neuen Produktionen standen nun auf des Messers Schneide. Schließlich erklärte das Bolschoi Prokofjews Romeo und Julia als „nicht tanzbar“, die geplante Produktion wurde somit gestrichen. Prokofjew war entmutigt, aber nicht verzweifelt. Wenn er sich auch nicht vollends über die Schwere der Bedrohung der Kunst durch die Staatsmacht im klaren war, so hatte er dennoch, eher durch Glück und Zufall, durch den phänomenalen Erfolg von Peter und der Wolf und der Suite aus dem Film Leutnant Kijé als echter Sowjetkünstler Anerkennung gefunden. Und obwohl es in Rußland nicht zu einer frühen Aufführung von Romeo und Julia kam, so setzte Prokofjew alles nur mögliche daran, um seine Partitur—von deren Großartigkeit er wohl überzeugt war—vor einem Fall in die Vergessenheit zu bewahren. Er schrieb zwei Orchestersuiten zur Konzertverwendung sowie eine Serie aus zehn Stücken für das Soloklavier, die er als sein Opus 75 veröffentlichte. Prokofjew präsentierte die Zehn Stücke aus Romeo und Julia erstmals 1937 in Moskau; diese Suite war zugleich die allererste gedruckte Fassung der Romeo und Julia-Musik. Die Elemente der Pianosuite waren, wie bereits erwähnt wurde, nah an der „Original“-Fassung der Ballettmusik. Wie sich herausstellte, erwies sich die Veröffentlichung von Prokofjews Opus 75 als geeignetes Mittel, um das Ballett selbst publik zu machen; im Dezember 1938 wurde Romeo und Julia schließlich zum ersten Mal aufgeführt, und zwar nicht in der UdSSR, sondern im tschechischen Brünn. Die russische Erstaufführung gab merkwürdigerweise nicht das Bolschoi, das ja der Auftraggeber war, sondern im Januar 1940 die Leningrader Kirov-Gesellschaft. Man kann es jedoch nicht deutlich genug hervorheben, daß Prokofjews Opus 75 als völlig eigenständiges und unabhängiges Klavierwerk zu betrachten ist, und nicht nur als eine Partitur aus „zweiter Hand“. Bei der Pianosuite gibt es aus musikalischen Gründen eine wesentliche Änderung der Ballettanordnung (man sollte hier keine aufreihende Darstellung der Bühnengeschehnisse erwarten); die Klavierfassung unterscheidet sich von den Orchesterpartituren (Ballettpartitur und Konzertsuiten) hinsichtlich des verwendeten Materials. Die Tatsache, daß Prokofjew eine eigene Opusnummer verwendete und die Suite persönlich im Rahmen eines Konzertes vortrug, unterstreicht ganz klar die Bedeutung, die er der Klavierfassung beimaß. Doch ganz gleich in welcher Version wir die Musik hören, sie könnte von keinem anderen Komponisten sein. Prokofjews einzigartige, bewundernswerte und unvergeßliche Schöpferkraft findet man in nahezu all seinen ersten siebzehn veröffentlichten Kompositionen; gemeint sind damit jene, die er während der zweiten Hälfte seines Studiums am Sankt Petersburger Konservatorium schuf, das er ab 1904 zehn Jahre besuchte. Darunter fällt auch seine 1912 geschriebene und im darauffolgenden Jahr veröffentlichte, brillante Toccata in d-Moll. Es gibt im Inneren Hinweise darauf, daß der Komponist ursprünglich beabsichtigte, die Toccata als Bestandteil in seine Zweite Klaviersonate, Op. 14, aufzunehmen, die er zur gleichen Zeit komponierte und die über die selbe Tonalität verfügt. Er nahm sie schließlich wieder heraus und veröffentlichte sie als separates Konzertstück. Die erste öffentliche Präsentation dieses Werkes gab es erst am 10. Dezember 1916, als es Prokofjew selbst im Rahmen eines Konzertes spielte, in dem er auch seine Sarkasmen, fünf Klavierstücke, Op. 17, zum ersten Mal vortrug.